One of the largest international healthcare techno fairs, Arab Health 2019, is winding down in Dubai. This was the first event in this this year attended by Moscow-based companies through the Made in Moscow exports promotion programme. The various manufacturers united under a common brand, Made in Moscow, showed more than 30 state-of-the-art creations, including hardware and software technology, diagnostics equipment, as well as projects at the confluence of medicine and robotics. Vit-Medical is a unique Russian-made device for vacuum instillation therapy created using all the latest technologies. It makes the healing of a wound three or four times faster for half of the price of similar foreign-made solutions. Vit-Medical was created by a company from the Strogino technopark where it has its R&D unit. With the support of the Moscow Government, it has been able to take part not only in Russian exhibitions but international ones too. Another new creation is a short-wave infrared (SWIR) camera made entirely from Russian components. It is as functional as similar foreign-made cameras, and was designed for visualising infrared images in the 0.9 – 1.7μm wavelength range. A camera of this kind can be used for round-the-clock observation in poor lighting conditions or extreme weather. It can help find camouflaged items, ignition sources or laser light sources. The camera is also relevant for medical equipment, including in hardware for coherence tomography. 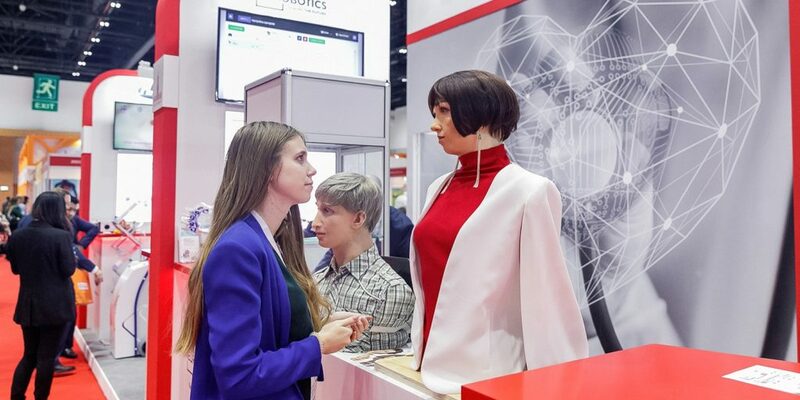 Exhibition goers were greeted by Alisa, an interactive anthropomorphic robot made by Neurobotics, a company within the Zelenograd Development Corporation. This android is able to understand facial emotions and respond to them. The robot’s first version was created in November 2011, and it has been subject to constant improvements ever since. In the latest version, Alisa has a body with articulating arms and neck, making its appearance even more human. Humanoid robots can be used as interactive display models, replace advisors or secretaries, or even teachers in class. In addition to this, androids can take on the role of baby sitters or medical aides, and could learn to offer primary medical care services. Visitors at Arab Health 2019 could also discover compact connected digital thermometers connected with the Smartphone that will be especially useful for parents with small children.